California lawmakers weighed a series of difficult options on Wednesday to revamp laws designed to lessen the likelihood of catastrophic wildfires, and considered the thorny question of who should foot the bill for blazes sparked by equipment belonging to the state’s investor-owned utility companies. 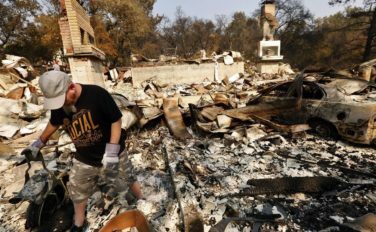 The hearing in Sacramento came as fire officials reported eight major summertime blazes burning their way through large swaths of the state. No actions were taken by the committee that was convened last month by leaders of the Senate and Assembly. The informational hearing was a prelude to what’s expected to be an intense political battle over wildfire prevention and liability when legislators return to Sacramento next month. “If the Legislature fails to act, avoidable fires will continue to happen,” said state Sen. Bill Dodd (D-Napa), co-chairman of the special legislative committee formed to lead the discussion. Half a dozen experts, including scientists and regulators, presented a broad overview of the difficult path ahead. That includes answering questions about what to do when Californians move into high-danger fire zones, the less-stringent standards allowed on older structures and how to balance the costs of major fires between utility shareholders, insurance companies and homeowners. It’s unlikely that lawmakers will be able to rely on a single piece of legislation, Senate Bill 901, as the vehicle for a comprehensive plan. And the calendar — with the two-year legislative session nearing its end — does not offer much time for the public to vet any new proposals. “We have four weeks to work on a major legislative package,” Sen. Ben Hueso (D-San Diego) said. Michael Wara, a climate and energy researcher at the Stanford Woods Institute for the Environment, told lawmakers they should instead think of the problem in two steps: addressing the fires and costs that have already occurred, and creating a structure to mitigate future risks. The financial impact of fires could prove to be the most combustible part of the discussion in the state Capitol. Last month, state fire investigators concluded that equipment owned and operated by Pacific Gas & Electric Co. was responsible for a dozen deadly blazes last October in Northern California. PG&E has said it expects to pay at least $2.5 billion in damages. That has led some utility executives to ask the Legislature to replace the state legal standard governing liability. Known as “inverse condemnation,” it requires companies to foot the bill for property damage caused by their equipment — even in cases in which safety rules were followed and without a determination of negligence on the company’s part. “As we have stated previously, we believe comprehensive public policy reforms are urgently needed to address the challenges brought about by more frequent and more intense wildfires,” PG&E spokeswoman Lynsey Paulo said in a written statement. But the midweek legislative hearing, which lasted more than four hours, made clear that there’s no consensus on whether to change wildfire liability rules for the utilities. “Our current laws level the playing field, bringing multimillion-dollar companies to the table with victims to settle for damage,” Mendocino County Supervisor Carre Brown said. Others took direct aim at PG&E in their comments to the committee about changes to liability laws — and fears that ratepayers will ultimately be asked to shoulder the costs. A separate bill that would allow PG&E to use state-secured bonds to pay its 2017 wildfire costs was not considered by the special committee on Wednesday, but was referenced several times at the hearing. Under the proposal, the bonds would be paid back over time, lessening the immediate impact to the company’s bottom line in the short term. The governor’s proposal only applies to wildfire liabilities beginning in 2018. It includes higher fines for utilities and additional state oversight of new, enhanced wildfire-prevention plans. Michael Picker, president of the California Public Utilities Commission, told lawmakers that fire safety regulations his agency adopted last year will help, but won’t be cheap to enforce. “We probably could have gone further, but our ratepayer advocates reminded us that there’s a cost to safety,” he said. Picker faced a series of intense questions about whether the CPUC does enough to ensure that utility equipment complies with wildfire-prevention rules. He said that the size of the system — some 4 million utility poles statewide — means the commission must rely on audits more than inspections. Assemblywoman Eloise Gomez Reyes (D-Grand Terrace) suggested that wasn’t enough. “Even in your audits, you’re finding that the compliance is not there,” she said. Others on the bipartisan panel took aim at rules that limit thinning dense forests filled with dead or dying trees affected by a warmer climate. Lawmakers were also reminded that the amount of land in the state endangered by fire has rapidly expanded. The newest fire map of California shows a heightened threat for some 70,000 acres — almost 44% of the state’s land mass, Picker told the committee. Wara warned the committee that wildfires present a complicated challenge, one that’s as much economic as it is environmental. He hinted that lawmakers might make things worse, not better, by trying to quickly craft a broad and far-reaching policy plan.